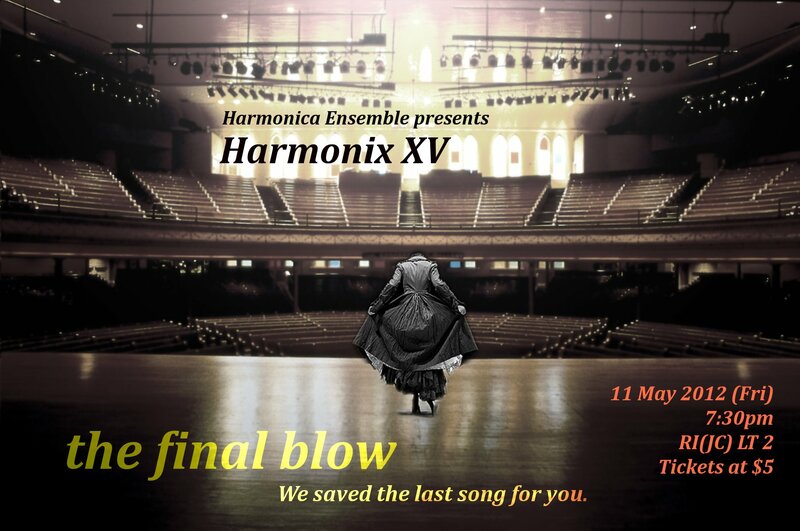 On the 11th of May, Harmonica Ensemble took to the stage for the last time to present their farewell concert, aptly christened The Final Blow. 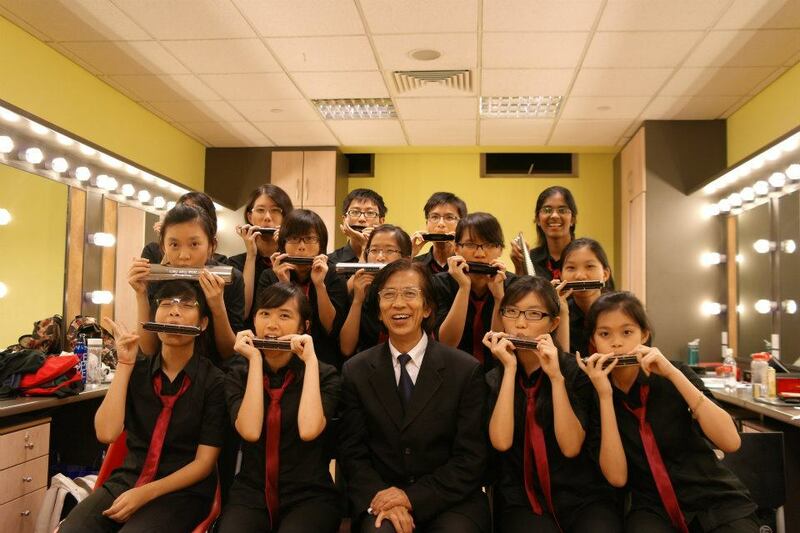 The diverse audience profile attests to their 15-year legacy under the tutelage of celebrated harmonica virtuoso Yew Hong Chow — CCA alumni, harmonica ensembles from other schools, and friends of the conductor turned up to witness this final performance. The first part of the evening’s varied repertoire swept the audience into an exotic, international soundscape, starting with Béla Bartók’s Romanian Polka. Accompanied with Mr Yew’s jaunty conducting, its lightness and whimsicality set the stage for the subsequent group item La Cumparsita, a tango from Uruguay. Different harmonica types, including the bass and chord harmonicas, complemented each other to create a sultry, layered harmony that momentarily transformed LT2 into a milonga in Bueno Aires. Song of India, from the opera Sadko, led the audience eastwards to Asia in a wistful, meandering solo by Zhang Jingwen. Following that was 夜霧の馬, a Japanese composition brought to life with powerful execution. The recurring dramatic trills made for a majestic, Oriental flavour. Rounding off the ethnic theme was the expressive La Sevilla by Adrea Soh, originally a guitar work that translated well on the harmonica. The iconic Flight of the Bumblebee on the other hand, in featuring non-stop lengths of chromatic notes, would be almost impossible to play in a single breath on a wind instrument like the harmonica. It was certainly a valiant effort — soloist Tan Zhiru’s fingers were a blur as they fluttered wildly to produce the distinctive urgent buzzing that left the audience positively breathless at the end. Humoresque was one of the evening’s most stellar items — fluidly rendered by the full ensemble, the euphonious quality of the harmonica and accordion successfully captured the depth of the lower notes. The end result was a fanciful spectrum of moods that closed the first half of the concert. Post-intermission, Harmonica bared their souls with an elegiac selection of nostalgic pieces. The alumni ensemble donned their old uniforms and sat on desks, ankles crossed, to play the theme song from the 2011 Taiwanese flick ‘You are the Apple of my Eye’. Along with The Carpenters’ Yesterday Once More, the alumni impressed with a clean delivery that made for a plaintive and reminiscent mood. Bach’s Air and Jesu, Joy of Man’s Desiring, performed by Wang Chen Yan and Natalie Yeo respectively, were mesmerising as well. The former, with its long, melancholic notes and a well-matched piano accompaniment was achingly serene while the latter exuded a seraphic joy. Both current and ex-harmonica players then came together to pour their hearts into a soulful rendition of Auld Lang Syne — evident from their bobbing along to the music and furrowing of brows. As the evening drew to a close, Harmonica Ensemble whipped up a zesty arrangement of the contemporary Viva La Vida to accompany their video montage that chronicled 15 generations of harmonica players and their shared moments. But the audience was not content with letting the ensemble step off the stage just yet — rousing calls for an encore were answered with a festive rendition of Dance of the Comedians, which finished off the concert with a sensational flourish. This was no ordinary farewell — Harmonix XV was clearly intended to be striking swansong that encapsulated not only the poignancy of parting, but also the spirit of the ensemble and its members. Their simple goal for the evening: “We hope that our final blow was inspiring, impressive, and impactful.” And indeed, what a final blow it was.